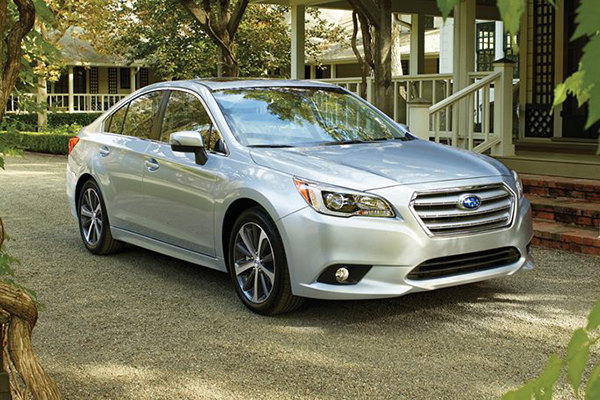 As a midsize sedan, the 2017 Subaru Legacy boasts both comfort and all-weather capability. Numerous awards attest to its capacity, including Top Safety Pick+ from the Insurance Institute for Highway Safety, Best Resale Value by Kelley Blue Book, and ALG Residual Value Award. The car is available in the entry level 2.5i; the mid-range 2.5i Premium, 2.5i Sport, and 2.5i Limited, and the top-level 3.6R Limited. Contact Briggs Subaru, your Topeka Subaru dealer, so you can test drive the 2017 Subaru Legacy. 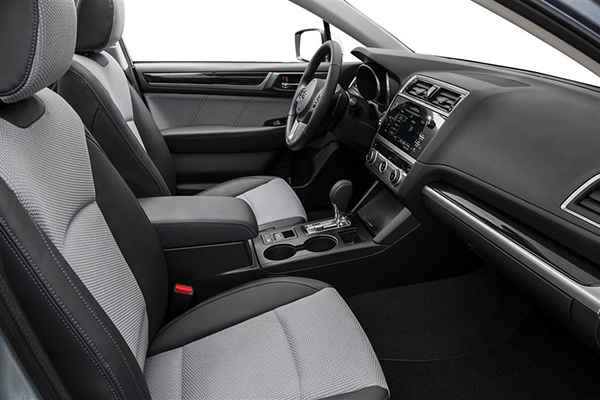 On your Legacy test drives in Topeka, you'll be surrounded by the high-quality soft-touch materials that permeate the passenger cabin. You and your riders can spread out in up to 119.6 cu. ft. of interior space and relax on available leather seats with built-in heating and air-conditioning vents for the rear. Up to 10 power adjustments are available for both the driver and front passenger with two-position memory for the driver settings. Connecting you to the rest of the world is the SUBARU STARLINK™ Multimedia. Through Aha, iHeart Radio, Pandora, STARLINK apps, and the available SiriusXM® Satellite Radio, you can enjoy music, weather, sports, news, navigation, and podcasts. Voice command lets you access these features while keeping your hands on the wheel. Or you can also swipe and tap on a screen measuring up to seven inches. Enjoy entertainment on your test drive from the 12 speakers and the 576-watt amplifier from the available Harman Kardon audio system. Through Keyless Access with Push-Button Start you can unlock the door just by touching it and activate your engine by pressing the Engine Start button. Your keys remain in your pocket or bag. The exterior is the first thing you'll notice when you test drive the 2017 Subaru Legacy. You get a choice of eight exterior colors, including Venetian Red Pearl, Crystal Black Silica, or Twilight Blue Metallic. Wheel sizes range from 17 to 18 inches in such finishes as steel with wheel covers, aluminum alloy, or Black aluminum alloy with machine finish. You can ask the dealer about other exterior options during your Legacy test drives in Topeka. Projector-beam halogen halogen headlights brighten the road on lower trims while High Intensity Discharge projector headlights illuminate the night in the higher trims. Optional steering-responsive fog lights aim where you turn your steering wheels to enhance visibility in bad weather. Allow fresh air and sunlight to flood the interior with the available power tilt/sliding moon roof. To cap off the design, chrome trims the available rocker spoiler and the available dual exhaust outlets. 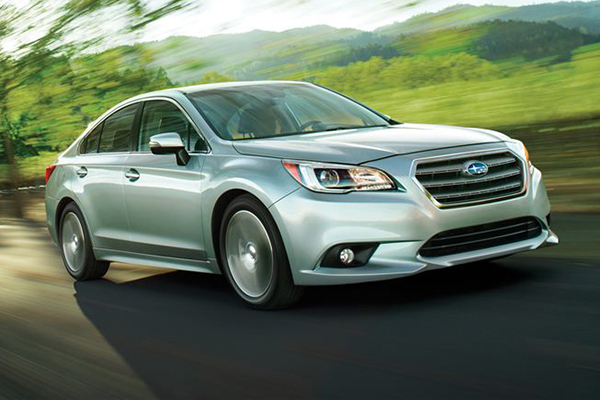 The 2017 Subaru Legacy comes with two SUBARU BOXER® engine choices. With Dual Overhead Cams and a Dual Active Valve Control System, the 2.5-liter 4-cylinder on the lower trim levels generates 175 horsepower and 174 lb.-ft. of torque. On the higher trim levels, the 3.6L aluminum-alloy six-cylinder uses the same technologies to produce 256 horsepower and 247 lb.-ft. of torque. The Lineartronic® Continuously Variable Transmission includes a six-speed manual mode with paddle shifters, Adaptive Control, and Hill Holder®. To keep your sedan on the path you intended, Vehicle Dynamics Control with Active Torque Vectoring monitors braking and steering. Symmetrical All-Wheel Drive routes power continuously to all four wheel so you retain a firm grip on any road surface even when it's raining or snowing. This feature stretches out through all of the center line of your vehicle to balance weight distribution and provide maximum control and performance. Also helping with road grip is the Traction Control System that applies braking force to slipping wheels when it uncovers a loss of traction. When you start on a hill, Incline Start Assist holds the brakes momentarily, so you have time to move your foot from brake to accelerator without the sedan rolling downslope. You hopefully won't be experiencing any of the safety features first hand when you test drive the 2017 Subaru Legacy at Briggs Subaru, your Topeka Subaru dealer. But you'll be protected by EyeSight® Driver Assist Technology, which keeps an eye on traffic, manages cruise control, and issues warning if you drift from your lane. So that you don't hit the vehicle up front, Pre-Collision Braking can put an emergency stop on your sedan. Another protective suite is SUBARU STARLINK™ Safety and Security, which includes Enhanced Roadside Assistance, Automatic Collision Notification, and Stolen Vehicle Recovery. With Remote Services, you can remotely locate your vehicle, unlock or lock the doors, and engage the horn and lights. When you back up, the rear-vision camera shows you what's going on behind you. Guidelines projected on the image enable you to judge your path as well as distance to obstacles. Rear Cross-Traffic Alert warns you of cars crossing your backward path. To prevent a collision with potential hazards, Reverse Automatic Braking can stop your vehicle. When you go forward, Blind Spot Detection relies on radars to detect vehicles that have entered your blind zone. When it's time to experience the pluses of the Subaru Legacy for yourself, then use the website or your phone to contact Briggs Subaru, your Topeka Subaru dealer. When you talk to one of the sales consultants, you can then schedule one of their Legacy test drives in Topeka and get all your questions answered.